I will readily admit that I am somewhat of a newcomer to the world of VoIP (Voice over Internet Protocols). 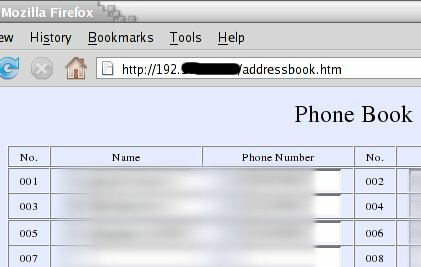 After playing with a ZyXel WiFi phone, I learned that I could port my local number to a VoIP provider, and then, in essence, own my phone number like I do this domain. If I move, or change telephone providers I can take my number with me. Obviously, the lure of cheap phone service was a factor too. After a bit of research, I chose Callcentric for my VoIP provider. My decision was largely based on their support of SIPBroker, a "co-op" of VoIP providers that allow free calls between the member organizations. It was somewhat of a case of "... an enemy of an enemy is a friend." If they are competing against the big Telco's, they are fighting for me. A review of a device that relies on a provider, as in this case, cannot help but to be a review of the provider too. I must say that Callcentric has been great. Thier customer support is almost as fast as IM'ing, and porting my local number to them, as well as getting equipment up and running, could not possibly have been a better expirience. Quaility and reliability has also been excellent. OK, so a VoIP user needs VoIP hardware. Softphones, USB handsets, ATA's... Why an Ethernet IP phone? Since I already had the ZyXel WiFi phone, I wanted a proper deskphone. 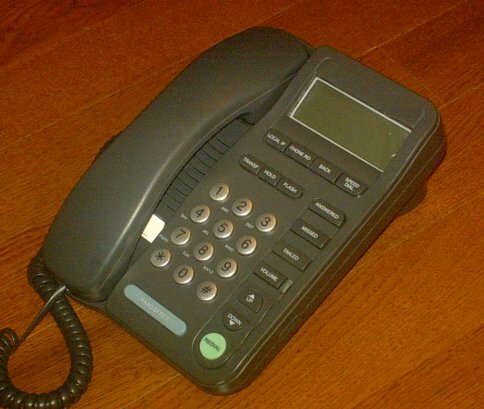 Plain deskphones are getting hard to find, and even if I found one, I would need an ATA (Analog Telephone Adapter) to use it with my VoIP provider. 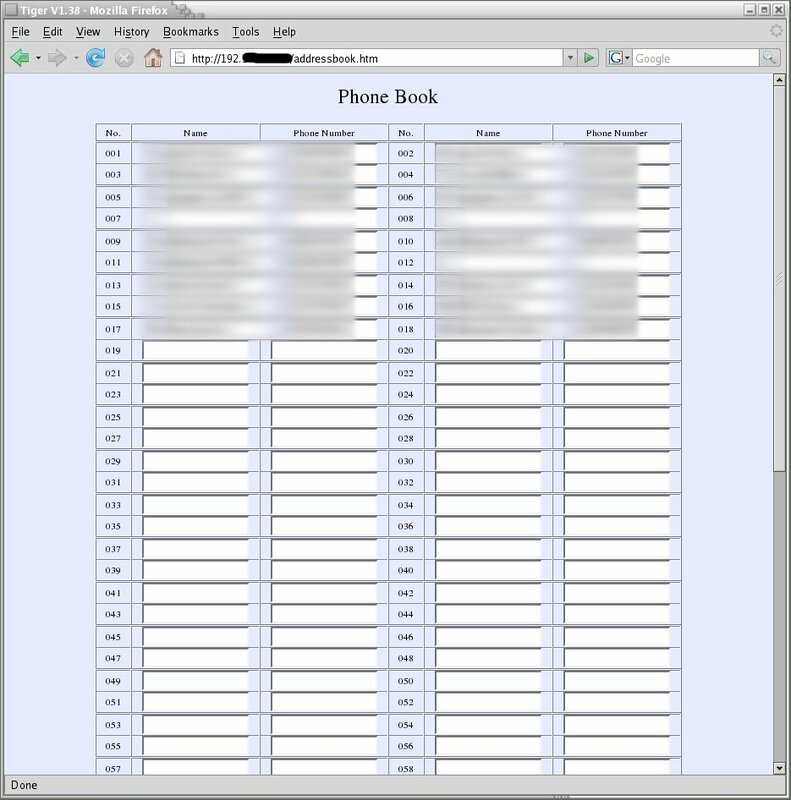 Also true IP phones have features such as web interfaces for settings and the phonebook. An analog phone connected to an ATA would not have this. Could I find a true Ethernet IP phone for the same price as an analog deskphone? If so what would the quality be like? Would it be acceptable for real phone calls? The Package ships directly from China. Not a problem - but I wish Amazon had made that clear to me. 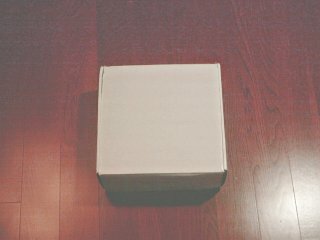 The box is not the fanciest I've seen. Haven't these people ever seen an Apple product? OKaaay... 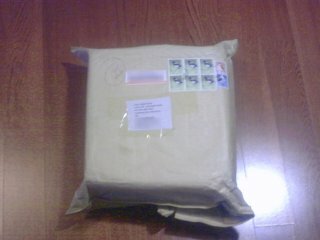 Some bubble wrap, and one piece of cardboard. Elegant packaging it is not. 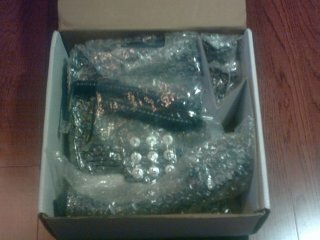 The total contents of the Box: phone, handset, handset cord, and AC adapter. No manual, and no Ethernet cable. 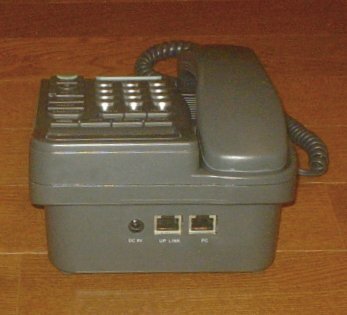 As I mentioned above, a VoIP deskphone like this would more commonally be found in an office environment, and not purchased by an individual. If a business orders 500 of these phones, I can see that they would not want 500 copies of the manual. Never the less, I think the average Amazon shopper expects to get a manual when buying an electronics product. Similarly, I have enough ethernet cables to... OK, I can't think of an anology that would not upset someone..., but the point is that customers will expect one in the box. The AC adapter was correct for the US, and is nice and small. Installing the phone is pretty obvious - Handset, Power, and Ethernet. Given that the "B" model has the built-in 2 port switch, it can share a desk with your PC without needing 2 Ethernet connections, or a seperate switch or hub. Be warned, however, that if you do this, you may be slowing your local network (LAN) connection. The internal switch supports 10/100 Megabit/s (auto switching). This means that if your computer and LAN support Gigabit (1000 Megabit/s) speeds, you'll get dropped down to 100M/s. Now, unless you are are Steve Jobs -- who allegedly is one of the few people who's home is directly connected to the internet back bone, it will not slow your internet connection at all, but file transfers to/from local resources may be affected. If you don't have any other Gigabit hardware on your LAN, ignore this paragraph completely. Connections are straight forward: Power and Ethernet. The "B" model has an extra Ethernet Connector. A portion of the settings screen - click to see the whole screen. Portions blacked out for obvious reasons. Some of these are pretty obvious, some can be figured out or guessed, and others... I still have no clue as to what they do. There is no help page, tool tips, or any other clues. Let's start off with some of the basic ones. The top is the network settings. These are pretty standard. Most installations will just set DHCP, as I did. The network will then set the other values. 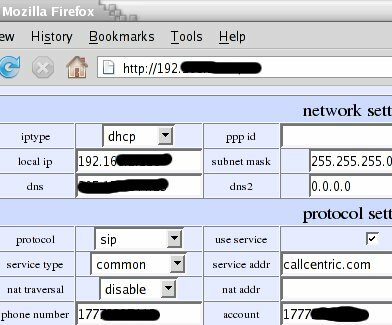 The second most likely is "static", in this case, your network administrator will give you values for the Local IP, DNS's Router IP and Subnet Mask. Note that the Phone's IP address must not be the same as your PC's, so you may need 2 IP adresses assigned to one wall jack. Some (ignorant) network administraors balk at this. The next section is for your VoIP service. While the terminology may not be exactly the same, you should be able to match up many of them with the values your VoIP provider gives you. One thing that is unique in my case is that Callcentric does not use STUN for NAT transversal. The phone does support STUN, and most other common forms of NAT transversal. Some of the settings in this section, as well as the section below have to do with using the phone to make direct calls to other, similar phones on the same LAN. Given that I am not using the phone this way, most of the settings in "Phone Settings" are blank. Call forwarding, etc. should be handled by your VoIP provider. Again, the settings under "Audio Settings" are dictated by your VoIP provider. VAD is voice detection (sends less data when you are not speaking). I have no idea what "age" is (in this sense, that is -- I am becoming more aware of the other sense every day, but that is beyond the scope of this article.) I can shed no more light on "aec" either. One may have something to do with what is known as "Comfort noise", and the other my have to do with local echo - the sensation of hearing your own voice in the phone, or the opposite - echo suppression or cancelation. These settings, and appropriate values for various VoIP providers can be discussed on the Linuxslate.com Forums. One setting I want to point out in this section is "ring type". Setting it to "user define" (sic.) is used in conjunction with the ability to upload a file on another page. (UPDATED: Some ring files are available. See Links below. Also includes link to a .pdf with instructions on how to make your own.) WARNING: Uploading a bad Ring File can ruin the phone, requiring a firmware re-load. It may even permenately "brick" the phone. Make sure Ring files do not exceed the 15K byte size of the examples. Being able to upload ring tones is something we expect on mobile phones, so I am coming to expect it on my deskphone too. The last section "Other Settings" has to do with administration of the phone. Like all devices connected to your network, change the passwords immediately. I also set the timezone correctly, and changed the time server address. By default, it was pointing to one in China. Any time server that supports NTP will work, but appearently you must enter the IP address, not a domain name. The one shown should be a good one for anyone in the eastern US. As an asside, note that the setting names and headings have no uppercase letters in them. They must have heard that typing in ALL CAPS on the internet is akin to yelling, and not wanting to take any chance of offending their customers, erred on the side of caution. After changing the settings, the unit will reboot, and it should log onto your VoIP provider, and report "Ready for Calls" in a few seconds. Even given the confusing number of settings, lack of any instructions, tool tips or help page, It still took me longer to clean up my desk to make room for the phone than it did to get the settings correct enough to connect to Callcentric and place a call. In addition to the settings page, there are much simpler pages for the address book, and a page that allows you to upload new firmware, the custom ring file, and a "Digitmap". A digitmap is used to determine what the phone does with certain dialed numbers. Like I said, I am a VoIP newbie, and anything beyond noting that the phone supports it is beyond the scope of this review. I should also note that I have found out how to do all of the same settings from the phone itself. Using the web interface is preferred. I have also discovered that the phone will accept a telnet session. It appears that some of the same settings can be adjusted here too. Personally, I would rather have 1 good user interface than 3 awkward ones. UPDATE: In my research for this article, I have found user manuals for very similar phones. See Links below. ADDITIONAL UPDATE: I have found new firmwares and a manual in M$ Word format. Note: v1.44 Made my Speed Dial work improperly, so I down graded back to 1.42 and the phone is working fine. This will "re-brand" the phone from "Tiger" to "JR168". Once the IP Phone is connected to your VoIP provider, using it is straight forward -- Lift the handset and dial. The light next to the Volume control has nothing to do with that button, it is simply a network activity indicator. It is quite bright, and when you are in a call, there is constant network activity, so the light flashes obnoxiously. Now where did I put my wire cutters? The 2 line display is easy to read, but has no contrast adjustment - even via the menus. It is also not possible to adjust the angle. If you sit low relative to your desk, you may have to stretch to see the display clearly. The contrast is set for someone taller. The display has a very nice green backlight, but it only comes on when placing a call. It does not come on when checking your missed calls, for example. When the phone is idle, the top line contains the time and date which is always accurate, since it is set by NTP. The second line alternates between the word "Tiger" and the firmware version. This is a bit obnoxious, and I'd sure like to hack the firmware to find and change this. Most expected features are there, but some are a bit awkward to use. For example, you must press "Handsfree" to turn on the speaker phone before doing an "On hook" dial. You must listen to a rather loud and obnoxious fake dial tone while you select the phone book entry you wish to dial. (So it's not really on hook dialing then, is it?) (UPDATE: See Update 2 in the above section. Updating to v1.42 fixes both speed dialing, and the sound of the dial tone.) Also, you must press "#" to actually get it to dial the selected phone book entry, but this is partly a "feature" of VoIP, and not really the fault of this phone. elegant, but it is sure better than phones that have no web interface. Entries are limited to the number of characters that will fit on the phone's LCD screen. You can also scroll through the lists of Missed, Answered, or Dialed calls, but I have not yet found a way to delete entries, or entire logs, without re-booting the phone. Yes, a reboot does clear these logs. However the phone also has space for 4 "AA" batteries that will keep it up during power glitches. Phone book entries and settings are not lost even if you omit the batteries. Overall, the sound quality is good. There is plenty of volume for both the handset and speaker phone, and the settings screens allow you to boost them even more if needed. The default "pcmring" ringer sound has the typical office phone sound - again no illusion of premium hardware, but not particularly obnoxious either. Any limitations on quality seem to be inherent limitations of VoIP, and the network, and not of the phone. The buttons are hard, and do not by any means give one a feeling of luxury or quality, but they are certainly adequate, large, and work fine. The case and handset feel solidly assembled, and I am sure it would stand up to the general abuse encountered in even the roughest offices. Like a lot of "generic" PC equipment, there is no manufacture information at all on the phone - not even a model number. There is an FCC sticker. UPDATE: While researching this article I found a security advisory that applies to this and a number of other low cost IP phones that use the same chipset. The vulnerability requires a specific, targeted attack from someone inside your network, and it must occur while you are connected to the administrator setting web page. If successful, the attack would allow them to change settings either immediately or anytime there after. By uploading malicious firmware, it would theoretically be possible to monitor your network traffic, or launch attacks from inside your firewall (assuming they previously had inside access already.) I believe that at some point a firmware update fixes this, but I have no relaible information at this time. It's not beautiful... It does not even come with a manual. It's web interface is lacking... Well, it's just plain lacking. It also may present some security issues. Never the less, it costs less than some plain analog deskphones. It makes and receives calls fine, and feels solid. 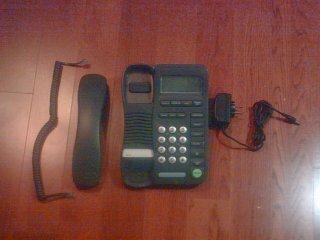 A business could sure save a lot by buying a few dozen or even hundreds of these and connecting them to the right VoIP provider.